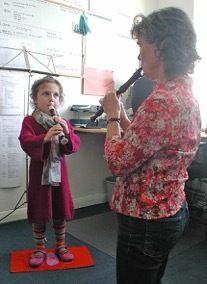 For the past 35 years I have been promoting the recorder as a serious instrument, and teaching both children and adults right through to Diploma level. 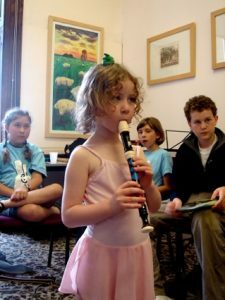 I have taught the recorder in Primary and Secondary Schools, specialist Music Schools, Universities, Adult Educational Centres as well as teaching private students and running workshops and courses for all ages. One of the most important things I have learnt during these years is that it is much more challenging to teach beginners, particularly small children, than it is to teach advanced – Grade 8 or Diploma standard – pupils. A lot of experience is required – a knowledge of how children develop both physically and mentally, an appreciation of the different temperaments and of how children respond at different ages – and it seems to me that most of these things can only be learnt through experience. I have also found out that it is much more difficult to teach someone who has been badly taught in the early stages. It is harder to change already formed habits than to introduce new techniques to a beginner of any age. As a result, I have recently found myself tending to take more and more beginners, and looking for new ways to pass over the skills that I have to younger and younger children. 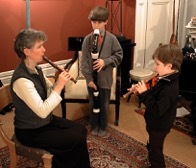 Children under the age of six or seven have not yet fully developed their co-ordination skills, and they find it difficult to cover the first three holes of the recorder without any leakage of air, a necessity for a clear note. If you start a child on the recorder at the age of five, it can take as long as one and a half to two years to develop this co-ordination, during which time they can get very bored and frustrated. If you start them at age six and a half to seven this same process usually takes three to six months. 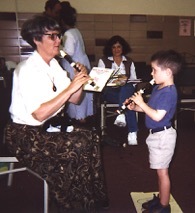 Having struggled with this problem for some years, I was surprised to discover in 2000 that the Suzuki Method had recently published material to teach the recorder, and that the suggested age for children to start was as young as four. I was intrigued to find out how they tackled the problem of co-ordination. I was already a believer in the Suzuki approach to teaching children, as my daughter had learnt piano from an early age with a Suzuki teacher. At that time I incorporated some Suzuki ideas into my own instrumental teaching, particularly that of learning aurally in the early stages and postponing the introduction of music notation. The Suzuki method is based on Dr Sinichi Suzuki’s realisation that every child, no matter what nationality or status, learns the most complicated language by listening and repetition. Suzuki Method has several names. One name is the ‘Mother Tongue Method’ since Suzuki learning resembles the process a baby goes through in learning to speak. A baby listens to talking for several months before attempting to speak. Even though the first attempts may not really sound like words, the parents are thrilled that their baby is trying to talk. They encourage the baby by praising its efforts, and by repeating the sounds it makes. The process of learning to talk is not a quick one. However, it picks up speed as the baby builds on the sounds that have already been learned. This process of learning to talk is the model for Suzuki, or the ‘Mother Tongue Method’. Students listen daily to recordings of music they are to play. At first, they learn simple steps related to playing the recorder, and repeat the steps until they feel comfortable with them. Praise and encouragement from teacher and parents, along with music games and activities, make the learning process fun and rewarding for the student. Another name for the Suzuki Method is ‘Talent Education’. This refers to the belief that all children are born with a wonderful potential that can bloom into a fine talent, if properly nurtured. 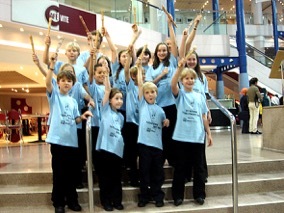 Suzuki teachers believe that the inner ‘talent’ of each student must be ‘educated’ in order to thrive. This means that beautiful playing results from careful study and consistent hard work, not from inborn ‘talent’. I discovered that the Suzuki Recorder Method uses a very original way of teaching small children which answers the problem of lack of co-ordination, and I became eager to find out more and to see if it really worked. In addition, I was excited to find that the Method uses a lot of the material I love from the Early Music and Baroque Recorder repertoire, employing, from the very first two note song, excellent recordings by Marion Verbruggen (a world renowned performer and teacher) accompanied by full continuo. On investigation I discovered that the British Suzuki Institute were looking for someone to start a recorder programme in England, preferably an experienced recorder teacher who was prepared to undergo further training. I seemed to fit the bill! The BSI had already applied to the Laura Ashley Trust for funding and, subject to their approval, were prepared to support me going out to the USA to train with Kathy White, the only qualified Teacher Trainer on recorder. So the summer of 2000 saw me travelling to Cleveland, Ohio for a two week course at Kent State University. We had a small but interesting and stimulating group of teacher trainees from all over the world – USA, Canada, Taiwan, Argentina and Holland. We also had several families from Peru, whose children joined some local pupils for master classes that we could observe. I was surprised to learn that there was already a flourishing Suzuki recorder programme in Latin America and Taiwan, whereas there was nothing in Europe at all. The course covered Suzuki Association America (SAA) Units 1A and 1B which concentrated on the Suzuki Philosophy and the teaching of Book 1. I was so intrigued by it all, that I also observed Units 2 and 4 (teaching the pieces in Books 2 and 4) and my time was completely filled with absorbing this fascinating approach to teaching children of all abilities. The most illuminating thing that I witnessed was a small boy having his first lessons with Kathy. By the end of his second lesson he was able to play One Bird (the first song in book one using the notes F# and low D) , with both hands in a relaxed position on the recorder and using a gentle breath pressure and articulation (no squeaks!) This was an achievement that would have taken maybe two years to accomplish with my own teaching methods. The most radical difference was the idea of taping over most of the holes, thereby enabling both hands to assume the correct playing position immediately. Because the child did not have to worry about pressing down over the holes, the fingers were relaxed – something that many experienced players have difficulty with. Among the many things that I learnt during those two weeks, were a host of new ways to demonstrate musical ideas to the children: we blew up balloons, rolled balls, stretched elastic bands, played with hand puppets, blew at tissues, lay on the floor with books on our tummies, played partners (the child blowing the recorder while we did the fingers), whispered ‘tu’ and ‘du’ in our neighbours ears, threw up socks in the air, played lucky dip and took piggy back rides with our thumb. I also learnt to listen carefully to Marion Verbruggen’s tongue work on the recordings – working out the different articulations she was using. Listening is a fundamental training for any Suzuki pupil. One of the most frustrating aspects of being a specialist recorder teacher is being presented with pupils who have been badly taught at primary schools by class teachers barely one step ahead of the class. 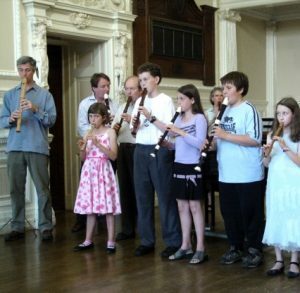 Although, on the plus side, this has meant that the recorder has become available to a large number of children, on the minus side, it has reinforced the unfortunate reputation it has acquired of a’ starter’ instrument – not a ‘serious’ option in the musical world. I was totally inspired on the course by watching and listening (without wincing) to videos of large groups of children playing the recorder together and making a beautiful sound. I was really thrilled to have been given this opportunity to acquire a training that not only added to my own teaching skills, but also held the potential of enabling me to inspire and guide a new generation of teachers to appreciate the unique qualities of the recorder, and therefore to teach the instrument in a fulfilling way. I continued my training by visiting America again in the summer of 2001 and completing SAA Units 2 and 3. In the summer of 2002 Jaap Delver from Holland and I invited Kathy White to join us and the Suzuki flutes at a Summer Workshop in England, where I took SAA Unit 4. This, at the time, was as far as we could go with the published material, and it has taken another three years to decide on and start recording pieces for Books 5 – 8. Meanwhile Jaap and I have been studying for the European Suzuki Association (ESA) Levels, which differ from the SAA, so that we can become sufficiently qualified to start our own Teacher Training Programme in Europe. 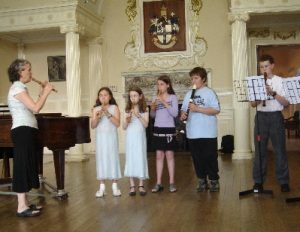 In the summer of 2005 we ran a Suzuki recorder student workshop at Culford in Suffolk, in conjunction with the Suzuki flutes, which was a great success and was the first of our annual Suzuki Flute & Recorder Summer Schools. In 2008, having gained my ESA Level 3 and the Suzuki Instructors Certificate I started the first European Level 1 Teacher Training Course with three students – from England, Finland and Belgium .